We’ve had some big 3.0 plugin releases over the last few weeks, but today’s Tin Canny release is the biggest overhaul yet. It’s basically a complete rewrite of the reporting engine to improve performance and scalability on larger sites, with lots of smaller improvements and new features thrown in to round things out. Almost everything about reporting is now different, so if you’re an existing user, we highly recommend testing on a Staging site first. Beyond the improvements behind the scenes, there’s a lot different on the front end too—starting with a complete redesign of all reports and charts. They’re far more mobile-friendly and easy to use. Breadcrumb links are new, and now individual user reports include Gravatar images if available for your users. This helps to personalize reports and make them more visually appealing. Tin Canny hadn’t yet fully supported Adobe Captivate 2019, but now it does! The 3.0 release of Tin Canny will help you get more out of Captivate on your LearnDash sites—as will even more controls over resetting Tin Canny SCORM and xAPI records. Tin Canny 3.0 supports purging records for individual users. For testing purposes or clearing bad data, this is going to be a big help to a lot of sites that need to reset user records independently. Rounding out the list of new features, Tin Canny users can now disable the Tin Canny dashboard widget to improve load times, and more Gutenberg block support has been added for the quiz reports. For a full list of the changes, make sure to read the changelog at https://www.uncannyowl.com/knowledge-base/tin-canny-learndash-reporting-changelog/. Existing users: Please do consider testing this on a Staging or Development site before you deploy the release on your live site. Tin Canny 3.0 has been through a lot of internal testing but there may still be slight differences in report output compared to what you’re used to. It’s time for another 3.0 plugin release! We’ve had some big 3.0 releases over the last few weeks, but today’s Uncanny LearnDash Groups 3.0 update is really in a class of its own with new features. If you use LearnDash Groups, you should be very excited. One thing that really set our Groups plugin apart was the flexible ecommerce offerings it made possible. You could create and sell course bundles to organizations, let people pick and choose their own courses to create groups, even set up all of that with subscription support. But it never offered a way for learners to add themselves to groups with a purchase. Well, now it does. 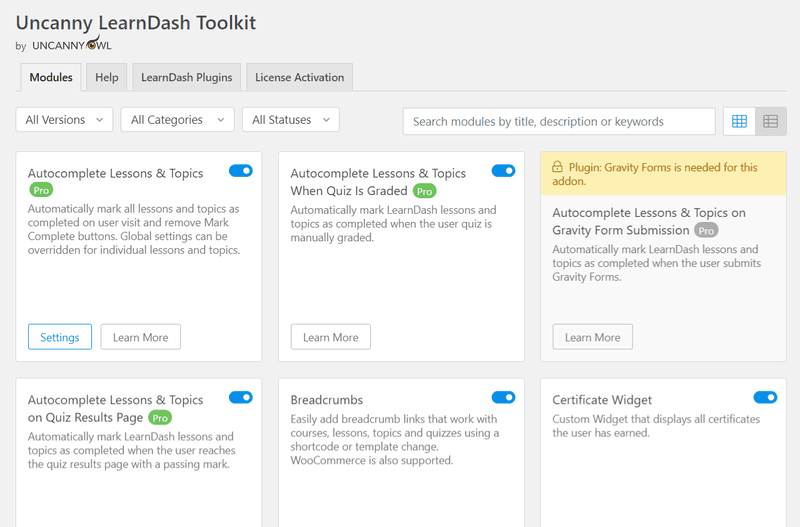 Learners can buy a WooCommerce product that adds them to a LearnDash Group automatically. Just create a product, map it to a LearnDash Group, and anyone that buys it gets added to the group. No codes, no changing the user to a Group Leader, the learner just gets instantly added to the group. And did we mention full support for subscriptions with the WooCommerce Subscriptions plugin? That’s right, set up a subscription product, map it to a group, and the user gets access to the group but only for as long as they keep paying. That’s a huge benefit to LearnDash sites, but it’s not even the biggest change in the Groups 3.0 release. We listened to feedback from our users and in 3.0 we added full front-end management of assignments and essay questions for Group Leaders. Definitely one of our biggest complaints since launch was that Group Leaders still had to visit /wp-admin/ for some Group Leader functions. Well, now they don’t. 🙂 There’s no longer any reason for Group Leaders to need wp-admin access if they use Uncanny LearnDash Groups 3.0. We know that’s going to help a lot of sites out. We did the same thing for quiz essays as what you see above for assignments; links to questions, grading, the course, lesson, quiz, and comments. It’s all from a single, streamlined interface in the front end. Our new Uncanny 3.0 plugin architecture for easier support and license management. No more “Existing User” option in the Add User modal! This was confusing; Group Leaders won’t necessarily know if a user is new or already exists in the system, so now we handle this automatically. Better translation support, multisite support and third party email plugin support. As always with our 3.0 plugin releases, this is a big one and we highly recommend testing things out on a Staging site before you take it live. This release means only one Uncanny Owl plugin still has an outstanding 3.0 release, and it’s Tin Canny. Look for that one next week! Following up on our recent Uncanny LearnDash Toolkit, Pro and Continuing Education Credits 3.0 releases, today we’re excited to announce the 3.0 version of our popular Codes plugin for LearnDash! The Uncanny LearnDash Enrollment Codes plugin makes it easy to add learners to LearnDash courses and groups using codes you can generate on your website. It’s often used to sell access to LearnDash courses and groups from another website (such as from Shopify), completely offline (a popular use is bundling codes in book sales or posting codes at trade shows), or even shared in newsletters. It opens up a world of opportunities for getting people onto your WordPress site and into LearnDash courses. In the 3.0 release we’re adding some frequently requested features that make it even easier to manage large sets of codes. A recent client project that required generating and managing over one million codes inspired us to add powerful code search capabilities and a way to expire coupon codes by date and time—automatically. As with all of our 3.0 releases, the new Codes update also includes some Gutenberg blocks as well as the new Uncanny 3.0 architecture. This includes easier access to support resources and our help desk. For those of you struggling with the move to Theme My Login 7.x, we have added support for TML 7.x and you can now extend its registration forms to support code redemption. Gravity Forms users get support for User Verification, and both translation support and multisite compatibility are improved. If you’re not yet using Uncanny LearnDash Enrollment Codes, now is the perfect time to check out what is by far the most powerful code-based solution for managing access to LearnDash courses and groups. As part of our series of 3.0 releases for our LearnDash plugins, today marks the release of the 3.0 update for Uncanny Continuing Education Credits. While Pro, Tin Canny and Groups tend to get all the attention, the Continuing Education Credits plugin is one that has been invaluable for some of our own projects, especially for the permanent record it creates of LearnDash course completions. With the latest changes, we’re confident it will be an even bigger asset to sites offering continuing education credits and compliance training. New Report Designs: We’ve completely redesigned both admin and front end reports so that everything is modern, responsive, and more intuitive. New Report Filters: Filter admin reports by date range, user or group. It’s even easier to get to the specific data you need. Gutenberg Block Support: We’re adding eight new Gutenberg blocks for shortcodes and reports to make it easier to incorporate credit reporting into the front end of your LearnDash site. Uncanny 3.0 Plugin Architecture: Now it’s even easier to get support right from your WordPress site and the control panel is aligned with our other plugins. The 3.0 release also includes a number of fixes and support for the new CEU column available in the Learner Transcript in the 3.0.1 Pro release. All things considered, it’s a big update to the CEU plugin and brings important efficiency and aesthetic improvements. If you’ve considered Uncanny Continuing Education Credits in the past but weren’t sure how it might add value to your site, make sure to check out our recent post on building compliance and recurring training programs that leverage some of the key features in this plugin. WordPress LMS plugins don’t track historical completions. Once a learner completes the course once, that’s it. They can’t trigger a second completion. If you reset course progress, it resets everything. That’s probably why plugins make it difficult or impossible to reset progress. With the help of some addon plugins, however, it is absolutely possible to use WordPress as a platform to deliver annual compliance training. This article outlines how you can do it with the popular LearnDash LMS plugin for WordPress. This is really the most important step. If you can’t track historical completions, you can’t offer annual compliance programs. Fortunately, one of our commercial LearnDash plugins makes this easy. The Uncanny Continuing Education Credits plugin automatically creates a permanent record of completions as users finish courses. Don’t let the name fool you; the plugin does far more than award credits for completing courses. And, for our scenario here, we don’t even need to consider the credit or certificate features included with the plugin. We just need to use it for the permanent record, so ignore the CEU and Total columns. The records in the table above are not pulling data from LearnDash, but rather the permanent course archive that the plugin captures automatically. As soon as the plugin is installed it records all new completions to the permanent record, so you never need to worry about progress resets or LearnDash changes affecting historical records. Now that you’re storing a permanent record of course completions, you need a way to reset user progress in courses so that they can retake them. After all, you don’t want to have to clone out a course each year and re-enroll students in the new one just so they can complete it again. One very simple option here is to use the Uncanny LearnDash Toolkit Pro plugin, with its Reset Button module, to allow users to reset their own progress and take the course again. Once it’s turned on, just drop the [uo_reset_course_progress] shortcode onto any course page where users need to reset progress. The button that it adds will allow users to retake the course and wipe out their previous progress (which is why it’s so important to have the historical record in place). If you’re a developer, you can even build your own workflows for resetting progress that better match your context. The Reset Button module mentioned above as part of Pro includes some tools that make it possible to incorporate our reset functions into your own code. More information is available in the Knowledge Base article. The solutions above require the use of 2 to 3 paid plugins, but there are possible workarounds that can be used with a bit more work. If you use a CRM and a tool like WP Fusion, you could potentially use Tags to track completion records instead of our Continuing Education Unit plugin. On an annual basis, what you could do is change completion tags in your courses so that it identified the course and year. In other words, maybe on completion of a course called “Physics” you set a tag of “Completed Physics – 2019”. You could then filter on the CRM side to show only users with that tag to see who was assigned that tag. You will still of course need some way to reset course progress, and for that options are more limited. By adding plugins to your LearnDash site like the ones mentioned above, it is very possible to offer annual compliance programs on your site that keep historical records and do allow users to retake the courses every year. If you have your own solution for offering annual compliance training that’s different than what’s outlined above, let us know your solution in the comments! Following up on our recent Uncanny LearnDash Toolkit 3.0 release, the 3.0 Toolkit Pro release is now also available! It’s a huge release that includes 2 brand new modules, several redesigns, new Gutenberg blocks and a whole lot more. Between the free Toolkit and the Pro modules addon, we now offer a whopping 37 powerful modules to improve your LearnDash sites. The Uncanny LearnDash Toolkit Pro 3.0 release includes 2 new modules: Autocomplete Lessons & Topics When Quiz Is Graded and Group Login Redirect. We know, the names are long, but at least they describe and do what you expect! The new Autocomplete module fills a gap for quizzes that are graded manually. With this new module turned on, lessons and topics associated with a manually graded quiz are completed automatically for the user when the instructor grades the quiz. It’s simple, but it makes things easier for students. The Group Login Redirect adds a new section to LearnDash Group Edit pages that, when populated, redirects members of that group to any page you choose on login. Maybe you want to take members of a group with only one course straight into that course, or maybe you want to take group members to a branded dashboard page just for that school or company. It’s a great option if you offer training to organizations. You can even set a redirect priority, so that if a user is in multiple groups, you can make sure you they land on the right page when they sign in. While it’s not a new module, our Learner Transcript module got a big overhaul, so it’s almost like new! It has a completely new, mobile-friendly design, better printing support, branded header and footer options, and you can sort data and include or exclude columns. This one is really exciting for us and we’re sure your students will love this improved way to see their progress across courses. Stay tuned for more 3.0 releases of our plugins over the next few weeks! Announcing the Uncanny LearnDash Toolkit Version 3.0! We just released version 3 of our super-popular Uncanny LearnDash Toolkit plugin and it has some really fantastic improvements! We've added support for the popular reCAPTCHA anti-bot service. Many more strings are now easily customizable through the module settings. The original design is selected by default, for backward compatibility with existing sites, so to use the new design you'll need to choose the new template from the module settings. If you are a developer and had overridden the previous template file, you'll need to update your template file with the new version as it includes many internal changes. We've also added a help page with links to relevant knowledge base articles right inside the plugin. And what would a new release be without improved support for the Gutenberg WordPress editor? Modules with front-end components (Breadcrumbs, Resume button and Front End Login) get new Gutenberg blocks to make it easier to add these elements to your Gutenberg pages. Lastly, we've included a number of bug fixes and minor enhancements to other modules. Check the changelog for the full list. We put a lot of effort into version 3 of the Toolkit and we hope you enjoy it! Existing User of the LearnDash Toolkit? Before you jump in and update your Toolkit plugins on a live site, we highly recommend giving them a try in a Staging environment first. Some of the changes are quite significant, especially the Front End Login module, and testing that everything still works as expected is important. https://www.uncannyowl.com/wp-content/uploads/2019/01/Uncanny_LearnDash_Toolkit_3_0.png 465 1203 Ken Young https://www.uncannyowl.com/wp-content/uploads/2016/04/uncannyowl-logo-600.png Ken Young2019-01-09 13:13:122019-01-09 13:14:27Announcing the Uncanny LearnDash Toolkit Version 3.0! Happy WordPress 5.0 Release Day! Are you ready for Gutenberg? Or, more importantly, are your plugins? If you use Uncanny Owl plugins on your LearnDash site, you might be ready. Users of the Pro modules of the Uncanny LearnDash Toolkit, Groups, Continuing Education Credits and Codes plugins are all set with the latest versions available from our site without needing to update. But if you use Tin Canny, make sure to update to version 2.9.9 or higher to use the Tin Canny uploader! Without it, you will not be able to upload your SCORM and xAPI modules to your LearnDash courses. Tin Canny 2.9.9 isn’t just about Gutenberg though. It’s a big release and the last update before the 3.0 release later this month, so we wanted to talk through some of the changes and what they mean for your site. Most important is, of course, the Gutenberg uploader for Tin Canny. It’s completely different than what you’re used to seeing for Tin Canny. Uploading modules is now done in Gutenberg using the “Tin Canny Content” block. By clicking that, you can choose to Upload a new module or Select from Library any existing content. All of the controls you’re used to for your modules are now displayed in the block settings on the right, including the settings you’re used to, like insertion type and dimensions. And that’s it! Making the transition to managing your SCORM and xAPI with Gutenberg might seem strange the first time you do it, but it really is a simple transition once you’ve added 1 or 2 modules. Outside of the Gutenberg-specific additions, we created a new page to find and manage your uploaded modules. The Manage Content page makes it easy to search through your uploaded Rise, Storyline, Captivate and iSpring modules, as well as preview them and delete them. No more having to dig through the Uploader tab in a post to look through and delete your modules (and we know many people didn’t even know that function existed). Better support for the H5P Course Presentation content type. Improved time zone support for the quiz reports. The next big release will be 3.0, so stay tuned for more news on that in the near future! Our LearnDash Groups 2.6 release is big. It adds features that make it easier for Group Leaders to add and communicate with group members. That’s right, we added email functions! And there’s new front end group creation, more Theme My Login support, changes to filters… Let’s take a closer look. Because inviting individual users, uploading users by CSV and enrollment keys weren’t enough for Group Leaders to add users to groups, we listened to your requests and added a new interface to add users in bulk. Rather than having to add one user at a time, now Group Leaders can add multiple users from a single page. For large groups, this addition could save a lot of time. For a lot of sites this will be a big improvement. Uncanny LearnDash Groups 2.6 adds a new feature that allows Group Leaders to email their students right from the Group Management page. To use it, there’s a new optional attribute for the [uo_groups] shortcode of “group_email_button”. 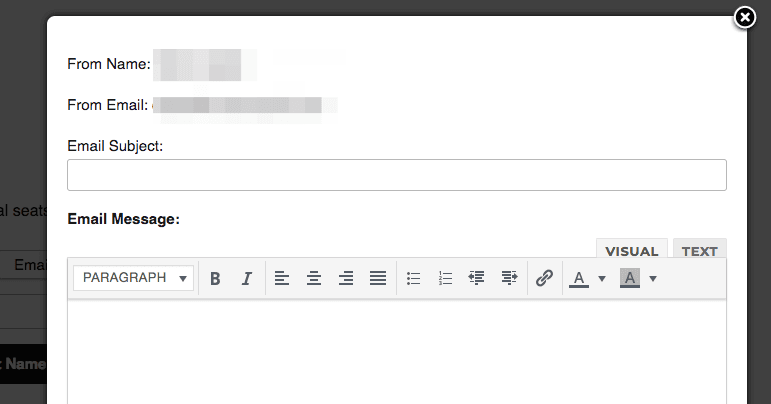 You need to turn this one on (so Group Leaders can’t suddenly send emails without you knowing about it), so make sure your shortcode looks like this to use the new button: [uo_groups group_email_button=”show”] (plus any other attributes you want to use). Please note that emails sent with this new functionality are sent on behalf of Group Leaders (so the reply-to address will be theirs) and that emails go to all members of the group. We’ve been reluctant to add this one, but by popular request it is now possible for users to create their own groups in the front end of LearnDash sites. Adding [uo_groups_create_group] as a shortcode to any page adds our Group Creation wizard to the front end, and the group creation form can be used by any user with the Group Leader or Administrator role. Be very cautious about using this shortcode and make sure the page is properly protected, whether it’s by membership plugin or other control, because in most cases you likely won’t want anyone to be able to create groups and add group leaders. It’s a very powerful feature, and we know it will be of use to many sites, but be very careful about access to it. 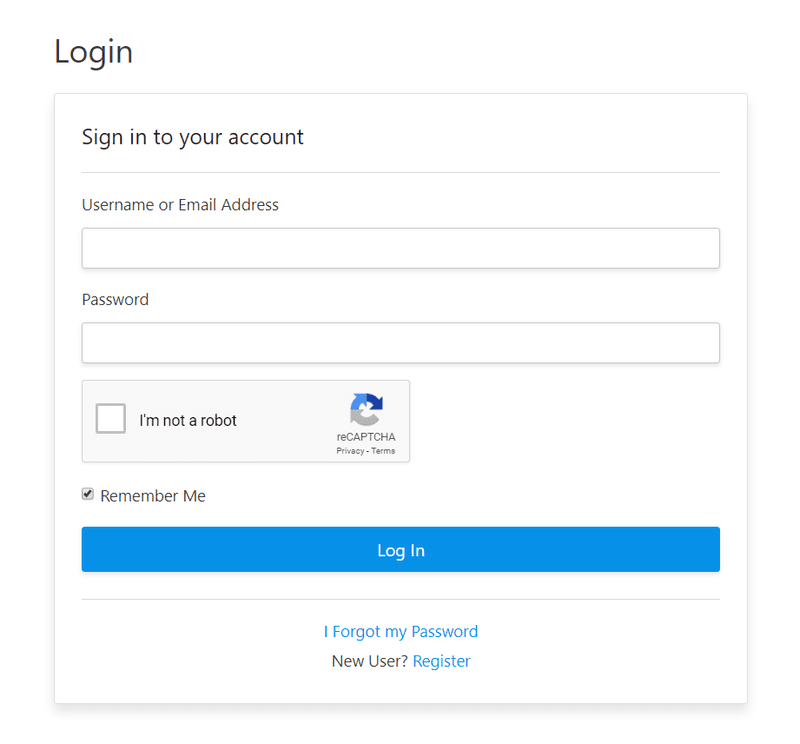 Theme My Login 7.x support has been added for registration forms. The shift to version 7 of this plugin has been difficult and we’ve largely stopped using it ourselves, but enough Groups users have it to make this update necessary. Drop-down lists in the course and quiz reports have been modified so that if there’s a single entry, that entry will be selected by default. That will save Group Leaders time and improve their user experience. The drop-down lists are now formatted to appear inline, rather than stacked, to save valuable page real estate. If you’ve applied custom CSS styling to these, you’ll want to check to ensure they still look good after you update. Developers will appreciate some behind-the-scenes changes for easier modification of the plugin and support for custom roles in our permissioning model. Bulk discounts have improved tax support when tax is included in the product price, and a number of other fixes are included to improve general reliability and usability of the plugin. All set to start using Uncanny LearnDash Groups 2.6? Make sure your license is up to date and then run the update on your site!